You can use your car's keychain remote emergency button alarm (or panic button) in a parking lot or parking garage to help ward off predators – and do the same at home. You probably already have one in-hand when going to and from your car. Why not get the most benefit from it? Walking to his car with a handgun to his back, Ali Irfan decided not to obey his attacker. Experts now say that each victim should evaluate their individual situation and use their intuition to decide to obey or not. If a robber wants valuables only, it's probably best to just give them up. But if an attacker kidnaps or locks themselves in with a victim, it might be better to try to escape. When the robber wanted Mr. Irfan to go to his car and open the door, Mr. Irfan pushed the panic button on his vehicle's key chain remote, and the robber fled. In this case, it turned out to be the right decision. Otherwise, the odds would’ve been worse for him – it’s almost always worse at a secondary crime scene. Most cars made since the late 1990’s have a key ring that attaches to a remote entry system transmitter used to lock/unlock your car. It also has a red emergency (panic button) alarm that will sound your car’s horn to help you find where you left your car in a large parking lot. Far more important, it can also summon help in an emergency, such as during a heart attack – or during a criminal attack. Most predators fear noise, witnesses, rescuers. But remember that each car’s emergency button is unique. Some work only from a short distance; some work well from a long distance. Or obstacles in a parking lot might block the radio wave signal. And some automatically turn off after only 20 seconds (check your car owner’s manual). Test yours to see how well it works in parking lots from various distances. Also test it inside your home to see if your walls block the signal to your car. If so, it might work through window glass. If your emergency button works well from your bedside, you can keep it there when you sleep. If you hear a noise outside or someone trying to get into your home, just press your button. Predators likely will flee; they don’t want concerned neighbors as witnesses – plus they’ll know you’re now on your guard. Simply make it a habit to always keep your finger on your car key’s button whenever you’re going to or from your car. Why not? Your keys are always in-hand anyway when you deal with your car, so you might as well take advantage of the built-in safety feature. It’s easy. Keep watching all around you while near your car – and have NO ear-pods, cell phones, or other distractions. See Parking Lot Safety and Avoiding Carjacking for more. Your car key’s button might help you in an emergency, but it does have distance limitations – it works only when you’re near your car. It’s useless if you’re too far away or if an obstacle blocks the radio signal. Another drawback is that your car’s horn may be honking urgently while you’re being attacked 100 feet away from your car. Witnesses might be looking at your car and not seeing what’s happening to you. Do you want better protection? A personal alarm shrieks more urgently than a car’s horn emergency button and pinpoints your exact location for witnesses. Most predators simply flee at that point, and very few would ever chase after anyone running away toward witnesses while making a hellacious racket. Predators want easy prey. And you can use a personal security alarm wherever you go – not just when you’re near your car. Also carry pepper spray. Attach it to your key chain so it’ll be in-hand and ready whenever you’re going to or from your car. Do the same at home while walking to and from your car – to defend against a carjacking, mugging, or home - mug-in (when you’re forced to go inside your home with the attacker). Just like an alarm, pepper spray can be used wherever you go – not only when you’re near your car. 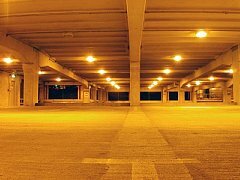 You’ll deter parking lot predators by making it obvious that you’re carrying pepper spray – held at shoulder height and very ready to spray. Predators prefer distracted, unprepared prey. If you look rough and ready, most predators will not choose you. What if the predator has a gun? See kidnapping escape.